On Wednesday July 4th Grimsey Review 2 was published. As a contribution to the debate we share here the submission we made to the review based on our #townteam experience and our connections with town centres and place management colleagues around the country. So here’s a list of potential ‘case study’ projects and initiatives we have worked through, plus some associated issues that we would raise from the perspective of our #townteam work in a number of Oxfordshire towns. 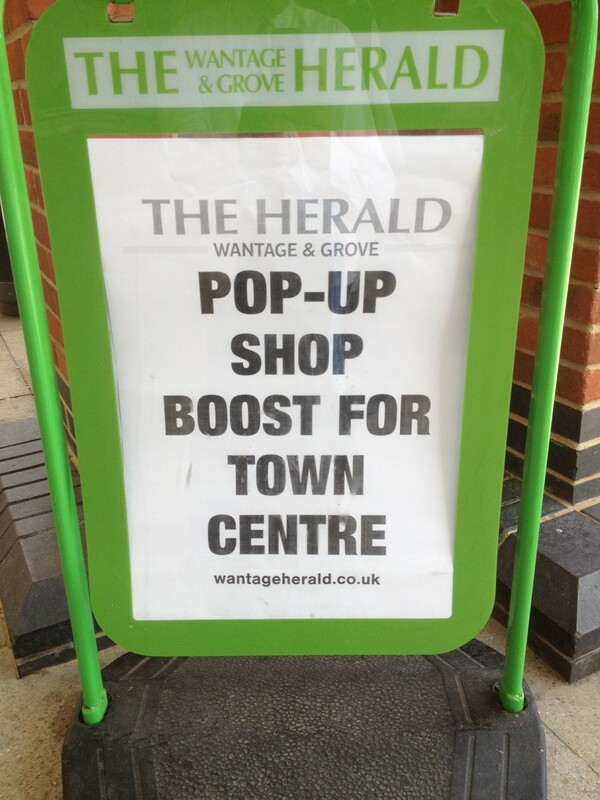 Pop up shops/short term let options – we have run these in a number of our town centres with the focus on giving a start to businesses which can go on to be part of a pipeline of new tenants for that town. The aim is to help overcome a significant barrier to new #indie businesses starting up, the typical landlord/agent requirement for 3, 5 or 10 year leases before they have the confidence and track record to warrant that. A variety of uses (what we call #morethanretail) – the increasing number of town centre spaces being taken by businesses outside the traditional ‘shop’ model (tho some have a retail/sales element) but which, in their own way, attract footfall that in turn supports other elements of the town centre mix. Examples include gyms. reptile rescue centres, galleries run by collaborations of artists, community spaces, kids play cafés, board game hubs & more. Also on our #morethanretail theme – encouraging shop owners (e.g. artists, flower sellers, upcyclers, chocolatiers, wool/fabric shops & more) to share their skills by hosting classes and workshops. It gives them an extra income stream and draws an audience that can be a customer for their shop to supply the craft/skill they learn. Where this is a feature of enough shops in a town, we encourage the town support organisation (town team or town partnership or BID) to promote that as a collective strength. Sharing space – both via our pop up shop projects and in our mentoring work for #indie businesses we are increasingly exploring ways for businesses to share space; it shares the rent and the time needed to staff the shop (especially valuable where those involved are designer/makers), and adds an extra offer to attract customers. Across our towns we’ve seen what would appear to be quite different products work in a shared shop. Splitting larger units – the bulk of the demand we see (including demand that remains unfulfilled in a number of our towns) is from smaller, #indie businesses. A deal of the empty space is larger. We’ve worked with landlords around splitting larger units to accommodate this. You’ve seen the Arbery Arcade, Wantage model but there are other examples, and could be – with landlords taking an innovative and supportive outlook – many more. E.g. in another town, we had a proposal to split a large unit of 2500sqft into 8 to 10 mini units, arcade-style with single entrance and common walkways, and we are working up a project for a BID to take 3 neighbouring shopping centre units to be shared by a group of indies. Engaging with property owners. As in most cases each shop is owned by someone different and typically a detached landlord who might even have bought unseen at auction, there is a place for the hard work of engaging with the owners and sharing a town vision with them, encouraging them to not let to the first non-value adding use that comes along but for a positive addition to that town’s mix. As far as issues go. You’ll no doubt have these on your list already, but here goes. Business Rates – wholly unfit for purpose. We can point to a variety of cases where the business rate system is a barrier to town centre lettings. Maybe just to highlight 3 examples. The 2nd unit rule (even with the current adjustment) where an indie coming into a town does not get SBRR if it’s their 2nd unit and (subject to transition), loses it on their first. (b) the transitional phasing arrangements are especially harsh (where RVs decreased by 30 to 40% as they did in a number of towns in our patch but due to TP the maximum decrease in rates payable is 10%). And (c) the lack of rates payable on empty listed units, as we have found that rates becoming payable on non-listed empty units after 3 months has a demonstrable positive impact in encouraging a property owner to facilitate a letting. We haven’t yet, but have felt we may well be able to make a statistical connection between long term empties and listed building relief. Use Classes Guidance – equally unfit for purpose (a) because the A1 category is not just for shops so other non-shop uses can take on a ‘shop’ unit without needing to ask. We can point to countless examples where a shop (bookshop, sports shop, goldsmith etc bid for a unit only to be outbid on rent and/or length of tenure by a beauty offer, estate agency, even a charity shop. (b) because now even changes to A2 uses, which would’ve been challenged as a loss of A1 before, are going through on the nod so we see ever more estate agencies in town centres in what were shop units. Both of these contribute to a reduction in the shop core in a town centre (even when there is demand from would-be shop tenants) and produce the ‘oh no, not another…!’ refrain from residents. Parking Policy – if it was health it would be called a postcode lottery. In (too) many places it’s a cash cow being run by councils with no account being taken of the impact of the policy on town centres. Town Centre First Policy – its hard to find any who believes we have one. In our experience its current outputs are very lengthy council officer reports, developers commissioning consultants to write reports that ‘answer’ the TCF criteria asked…and out of town retail centres approved (either first up or on appeal) that then inevitably damage the nearby town centre. Experience here that funding for town team work is being ‘reallocated’/withdrawn by councils, so that even town centres that have had the benefit of this work in recent years will not have it going forward.